WHSAD students, Errin Mickels, Dillon Lynch, Aedan Schoen Thomas, and Francisco Sandoval, evaluate a proposed design. 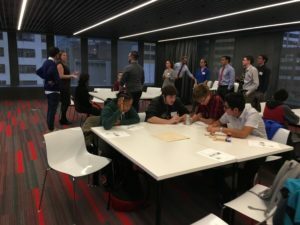 The Architecture, Construction, and Engineering Program, otherwise known as the ACE Mentorship, provides students with mentoring from professionals in specific fields in which students are interested. 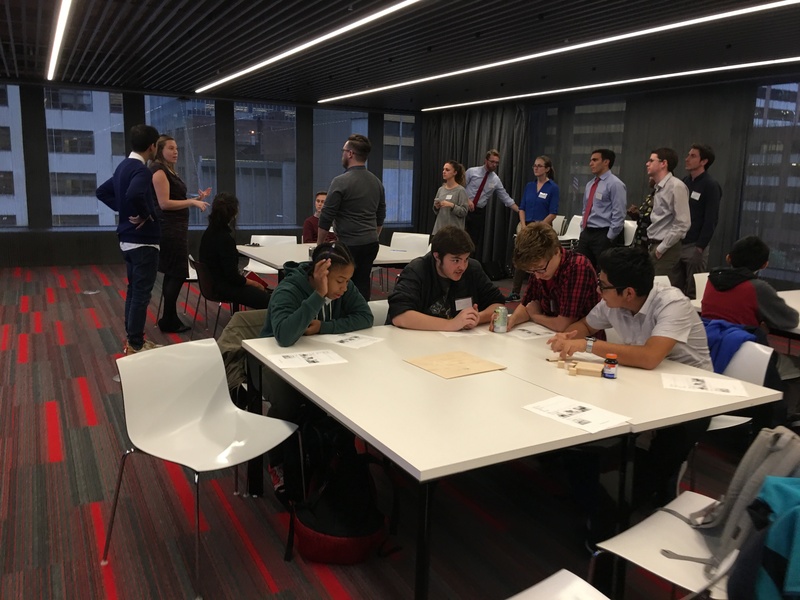 These mentors, coming from established companies such as FxFowle, Gensler, and Turner Construction, work with students in a hands-on manner to provide real-world work experiences. Such a program helps our students go beyond theoretical work and get down to the nitty gritty of networking, hashing out ideas, learning from mistakes, and meeting deadlines, thus preparing WHSAD students for the rigors and competitiveness of the architectural world. Below, sophomore Akil Bristol provides his take on a recent experience he and his peers had in the ACE Mentorship program. 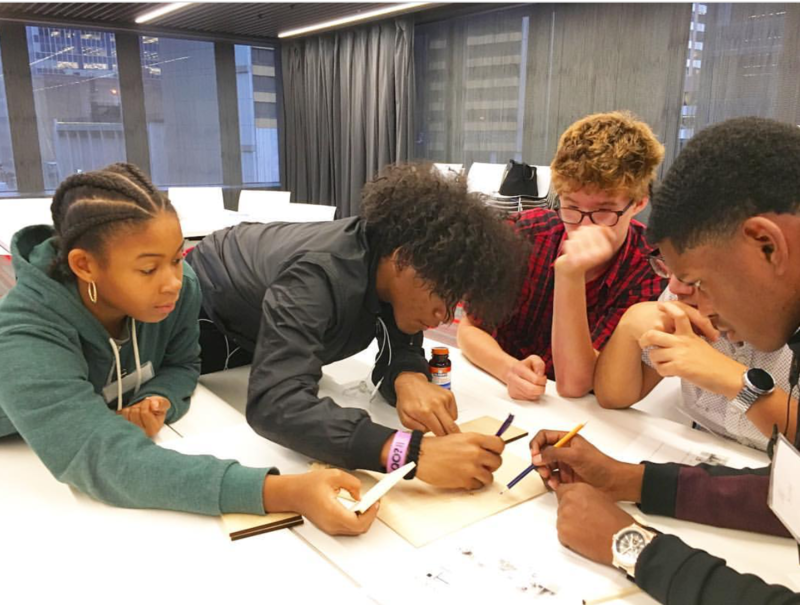 WHSAD students, Errin Mickels, Enrique Abrahams, Aedan Schoen Thomas, Francisco Sandoval, and Akil Bristol, dive in on a project. On Wednesday November 1st, our freshman and sophomore students went to an ACE Membership Meeting. My classmates and I traveled together taking the G to the F at 57 St., to arrive at the Gensler Office/Architecture Firm. As we walked in to the meeting room, Ace Team 6 managers greeted us kindly and offered us pizza and seltzer water. We signed in on a computer to affirm that we were there for the meeting. The managers of the Gensler Team started to introduce themselves. After, they proceeded to present and elaborate on the syllabus that they handed us. Introductions were over, so then we got separated into groups of 4-6. Staying at the same table, the managers gave the task of making an open and closed space. I immediately remembered the classwork and assignment from my freshman year at WHSAD. Using our previous knowledge of skill sets, we put it to use to create an abstract structure. It was interesting and sort of similar to what we learned, and we applied it to our board. Presenting the structure was hilarious and a new experience, a piece of the structure fell over. The managers were very understanding about it, and after we presented, we rebuilt it. Soon after everyones’ presentations, we all parted ways. Glancing at Gensler’s tall slim black structure, which gleamed as we walked away, I knew this experience would be embedded in our heads.